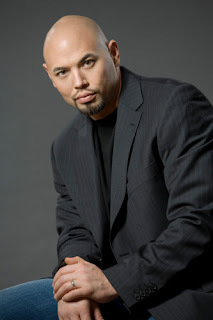 Singing Sarastro at tonight's performance is American bass-baritone Keith Miller, native of Colorado, former professional football player, Director of Opera and Opera Young Artists Program for the Crested Butte Music Festival, and all-around great guy. The city of Seattle has taken warmly to Miller while he was here making his Seattle Opera debut; last week, the Seattle Times Sports Page ran a story on him, and posted a Video Interview as well; and he also appeared on New Day Northwest, where he sang "O Isis und Osiris" for the studio audience. Yesterday, Miller sang the anthem for the Mariners, and today (before tonight's performance) he answers our questions about his career, the role of Sarastro, and singing those low, low notes. 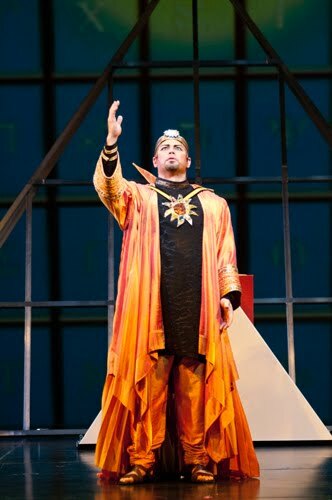 What’s your favorite moment in Magic Flute--either to perform yourself, or just to watch? vocal fireworks begin on "Du Du Du!" Mozart was a genius!! No argument from anyone on that, and I am so grateful to be a part of the retelling of this masterpiece! 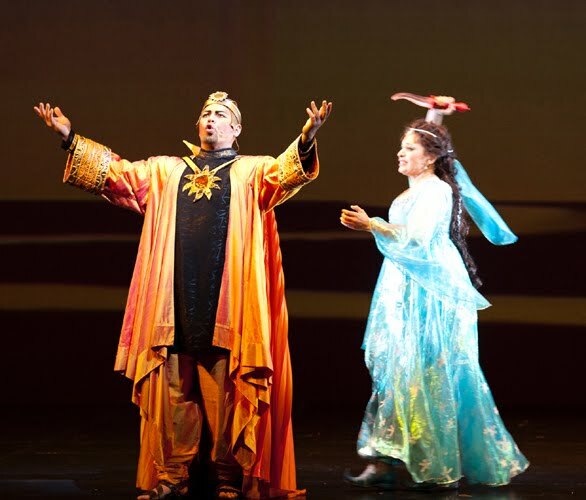 With The Magic Flute, do you have to be careful about warming up, so your voice doesn’t get so high that you can’t sing Sarastro’s arias? Yes, you do have to be careful as not to warm up so much for Sarastro. It is a very low role and what makes it especially difficult is that I'm singing Escamillo in Glimmerglass right afterwards. This makes the voice bounce up and down like a yo-yo! Do you consider Sarastro “good”? 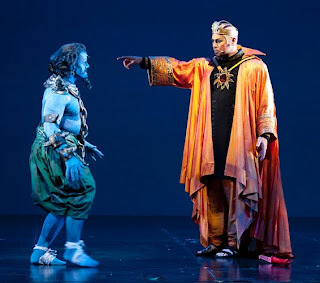 With Tamino not joining Sarastro’s brotherhood in this production, does that change how you perceive Sarastro as a person, and how you play his character on stage? Great question. I feel like Sarastro is is very much like a parent, with parental powers included. By this, I mean his powers are influence and education along with point of view and perspective. By showing Tamino these things, he is guiding him, educating him, and the fact that Tamino doesn't side with him in the end means that he has done his job well. I actually consider this to be the final passing of the tests. My own little interpretation! Tamino comes away with the power of choice. Just like a parent, the time to educate and raise our children comes and goes, and when they leave, you hope that they have gathered the lessons taught and begin a new and more prosperous life. In this production, this is how I see this relationship. This is how I know that Sarastro has done his job, and in the end, I think that he can feel proud that he has chosen wisely in Tamino. Why did you decide to make the switch from a career in football to a career in opera? Basically, I just followed my heart. The stars aligned and I found myself in the unique position of being able to play for probably two more seasons and beginning this journey into music. At that point, I realized that I couldn't imagine what my life would be like looking back at that moment, many, many years from now and saying to myself, "What would have happened if I had seized that opportunity to sing?" I have never lived with regret. But I realized then that if I didn't grab this golden opportunity, it was never going to come again. This is something that I would have regretted, and would have been willing to trade all those days that passed for the chance to come back to that decision and choose music. I would have traded my soul away. You’re training young singers and introducing kids to opera through the Crested Butte Music Festival. How did you get involved, and how do you balance these responsibilities with your performing career? Balance is a careful combination of doing what you need to do. Each task, whether it be my preparation as a singer, teaching, hearing auditions, auditioning myself, or anything else, is like a spoke of a wheel. Each spoke must be strong within itself, support equal weight and yet be distanced from the rest in order for the wheel to be aligned. I cannot allow myself to neglect what I need to do as a performer, for half of what my value is to young singers is that I am going through the process myself and they can learn from my experiences and follow my career in the making. I cannot concentrate completely on my music, because that would not allow me to administrate to my full effectiveness. The axle of this wheel for me is patience and foresight. Through these two things, all the spokes of my performing career and administrative duties are attached and supported. These two things sustain my career, the education I am providing for the Young Artists, how to balance the needs of my staff, and allow for the natural progression of time. The good thing is as this wheel turns, I am able to learn new things about myself, the business and most importantly music. The only way to balance a wheel is to let it spin. It's like a planet. If it continues to do its job, it aligns itself and everything falls into place.